What do you do when you're a young patient stuck in the hospital over the holidays? In one case, at least, it seems you devise elaborate schemes to lure Santa to the hospital. We recently learned of a young patient who was worried Santa and his reindeer might forget about him and the other kids who were hospitalized at Mayo Clinic's Rochester campus over the holidays. To ensure that didn’t happen, he made a batch of "reindeer food" he hoped would help lure Santa and his crew. Jean Henderson, a pediatric transport nurse, says she received a phone call in the morning on Christmas Eve from the young patient's child life specialist. Would it be possible, the specialist wondered, to take the "reindeer food" the boy was making to the helipad on the Saint Marys campus and sprinkle it around for Dasher, Dancer, Prancer, Vixen, Comet, Cupid, Donner, Blitzen and that other one? "I think we can do one better," Henderson told her colleague. "I'll take him up there, and that way he can see me do it, and maybe he can see the helicopter as well." And so, that afternoon Henderson helped the child get "all bundled up" for the big adventure, and the two visited the helipad up on the rooftop. "He got to meet a couple of the Mayo One crew members before we walked out and sprinkled his reindeer food around the helipad," she tells us. That wasn't all Henderson had planned. After taking the patient back to his room, Henderson hustled back up to the helipad to take a photo of the reindeer food — a special blend, she says, of "clay and glitter that all kind of stuck together." Then the husband of a colleague, fellow nurse Deb Abramson, added a little Christmas magic. 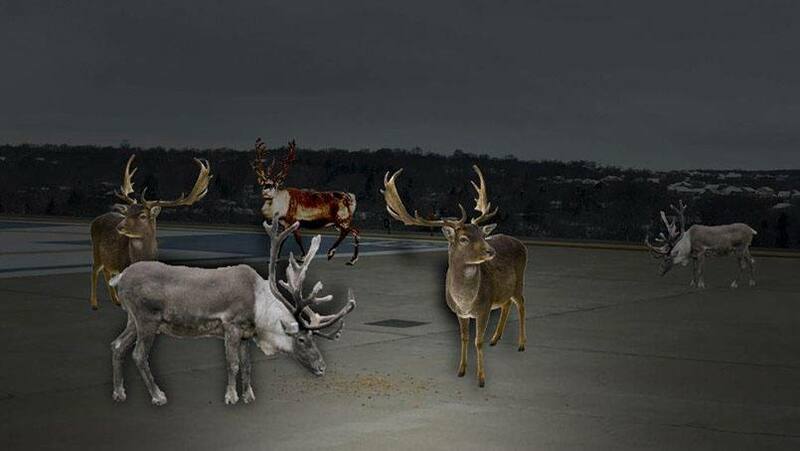 "He Photoshopped some reindeer into the photo and made it look like the photo was taken at night," she says. Henderson delivered the photo to her young patient on Christmas morning — photographic evidence that his plan had, in fact, worked. "His little face lit up," Henderson says. "His mom, grandma and his whole family were there, and they told me later that he couldn't stop talking about it. They said he shows the picture to everybody who comes into his room." And that, Henderson says, is exactly what she was going for. "I love kids, and anytime you can do something that makes being in the hospital better for them, that's such an important part of being a pediatric nurse," she says. "Seeing that smile on his face was very gratifying and rewarding." You can give us a gratifying reward by sharing your comments below. Then, you can use the handy social media tools to share this story with others. What a wonderful event for this young man! Thank you! this is fantastic – but this is the Mayo – in character! Also – must have been fun to make Christmas come a little closer! doesn’t surprise me….Mayo clinic has been sharing good things with me for over sixty years.